It is a brand new week with a brand new Monday and here I am with a brand new product review. If you have been following me on my Instagram you will know that last week I was down with the flu. Ugh! The flu zapped all my energy making it difficult to work. Last week was crucial for me because I changed my blog address from AlphaGirl.in to AlphaGirlReviews.com and this change required a lot of technical adjustments. The flu struck me at a very wrong time because of which my blog had to face technical issues for a few hours. But everything is cool now. My blog and I are both fine and rearing to go. 🙂 Last week I also had to attend an event because of which I was trying my best to recover soon. I did recover in two days but I looked terrible. I looked pale and my skin looked dry in patches. So, I decided to apply the SSCPL Aloe Vera Modeling Mask to help me look more alive. This mask is completely safe to use so you can apply it over your eyes and lips too. I have used this face mask twice and here is my experience with it. 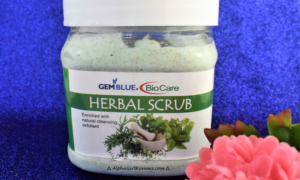 Ingredients: Aloevera, Seaweed Algae Extract, Bentonite, Kaolin. This mask provides instant hydration and moisturization to the skin. It detoxifies and tightens the skin to give it a natural glow and radiance. First, wash your face with your regular cleanser or cleansing milk. Apply a toner to your face with a cotton pad and wait for it to dry. In a bowl or even in the plastic jar that the product comes in, add regular water to the powder to make a thick paste of it. Mix it well to make a smooth paste. Apply all over face including eyes and lips. Leave it to dry for 15-20 minutes. Once dry, gently peel off the mask and rinse with warm water. My skin was feeling oily around my T-zone while the rest of my face felt dry. So, basically, my skin was in a ‘combination skin’ mode. Before applying the mask, I scrubbed my face with my regular face scrub. You are supposed to apply a toner after washing your face but I skipped it because my toner is slightly moisturising and since the mask is also very hydrating I decided to not go for it this time. I then took the powder in a bowl and mixed it with rose water. While mixing, do remember to make a smooth paste devoid of clumps. The first time I used this mask, I made haste and my mask was full of clumps because of which the mask did not dry as quickly as it is supposed to dry. Also, ensure that the paste is thick enough for you to peel it off easily. So, after making a smooth paste, I applied it evenly all over my face and waited for 30 minutes before peeling it off. The first time I used this mask, I found it difficult to peel it off because it took a lot of time to dry. So, this time I waited longer and the mask came out smoothly. I then washed my face with warm water. After using the mask I noticed that the dry skin around my cheeks felt soft to touch. The flakiness had vanished. My chapped lips also felt soft and smooth. This mask is highly hydrating and is most suitable for dry skin because of which I was a tad bit worried about my T-zone. But thankfully, the mask did not cause any breakout. Though my skin did look a little lighter I did not get the kind of radiance I was looking for. I could blame the flu for it but I noticed this even the first time I used it. The mask is highly moisturising and hydrating but not as brightening as the Charcoal Modeling Mask. I would recommend this mask to plump up dry skin but not for skin brightening. For my oily skin, the Charcoal Mask worked better at skin brightening. I give SSCPL Aloe Vera Modeling Mask 3.5 out of 5 rating. 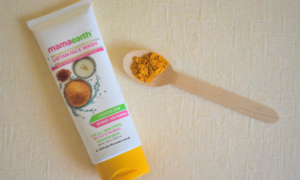 This mask is a good solution for dry and dull skin. You can purchase SSCPL Aloe Vera Modeling Mask from SSCPL Herbals.